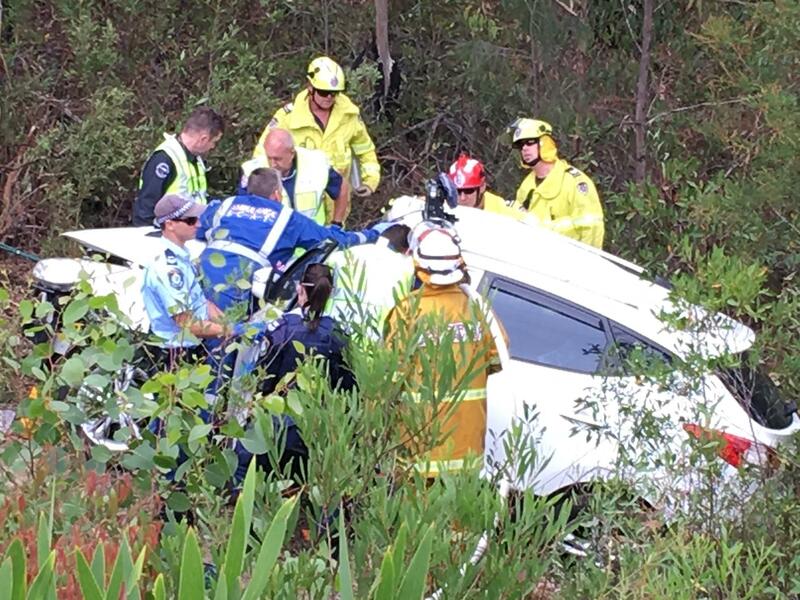 CANBERRA, Australia -- The father of a teenager who spent 30 hours trapped in a car wreck in Australian woods said Tuesday he had followed his intuition by hiring the helicopter that found his seriously injured son. Samuel Lethbridge, 17, remained in intensive care in a hospital with multiple fractures two days after the crash. Tony Lethbridge said he suspected his son may have been in a car wreck when he did not return by Sunday morning to the family home at Lake Macquarie, after a Saturday night out with friends in the nearby city of Newcastle. The teen had dropped off a friend about 30 miles from home early Sunday morning before he vanished, the father said. The 51-year-old father of three hired a helicopter on Monday morning and the car was spotted in scrub off a highway 12 miles from home. "When I saw the police, they thought he'd run away. I said that's not Samuel. When he doesn't show up or phone, something's seriously wrong," Tony Lethbridge told the AP. "I understand that they've got a lot to do and they hear this every day, but I took matters into my own hands and was thinking all night that tomorrow morning, I'm just going to get a helicopter and go looking for him because we're running out of time - it's been long enough," he added. The father recalled that a victim of an earlier crash in the area had died after not being found for five days. "I wasn't going to let that happen," he said. Lee Mitchell, pilot and part-owner of Skyline Aviation Group at Lake Macquarie, said he discounted his usual helicopter hire rate of 1,200 Australian dollars ($956) an hour when the father explained his plight. "He came in looking anxious and somewhat fatigued and said he needed a helicopter bad," Mitchell said of meeting Tony Lethbridge midmorning on Monday at the Port Macquarie airport. "He just said: 'I've got A$1,000 ($797) on me, will that be enough?' and we said: 'Yes, it would,'" Mitchell said. The helicopter took off soon after with the boy's uncle Michael Lethbridge aboard, because the father was prone to air sickness. The car was spotted within 15 minutes of flight, about 20 yards off the road, Mitchell said. "It was fairly easy to spot from the air. It would've been near impossible to see from the road because it was well below the road level," Mitchell said. "I really didn't want to go. I was scared of what I'd find. As I got closer I seen Sam's head move," Michael Lethbridge said. "I went from being terrified to ecstatic in a couple of seconds." "We were overwhelmed. It was a great outcome. We've done a lot of search and rescue stuff in previous years and they don't always turn out so favorably," Mitchell said. While Australians rarely pay for search and rescue operations, Tony Lethbridge, who works in a mail sorting room of the national postal service, has no complaints. "It's priceless. If it's A$1000 I've got to pay to get his life, I'm OK with that," the father said.